A forgotten trick from the past that was first invented by Howard Thurston and used in his big show. The effect is that the magician invites up a boy from the audience and without touching the boy, he gestures toward the boy and the boy's hair stands on its end running from the front to back the back of his head, like a magical ripple. The hair falls down back to normal. The magician raises his hand and the boy's hair once again stands on its end to the amazement of the audience. The magician quickly drops his hand and the boy's hair once again falls down, being normal again. The boy can then be used in any routine you wish. This feat was revised by Devin Knight in the 80s and used in his touring stage show for a few years to great success. 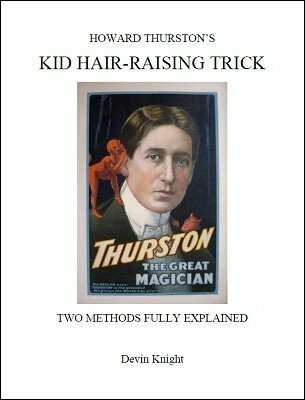 Devin gives you the original Thurston method, which requires two hidden assistants, plus a second method he devised for birthday parties, which you perform without any assistant. So you get full details on two methods, one for stage and one for close shows. This always gets big laughs while baffling an audience. There is NO static electricity used and at no time does the performer actually touch the boy. No electronics are used to make the boy's hair stand on its end. Add this feat to your shows and you will be doing something your audiences haven't seen before. 1st edition 2018, 6 pages.